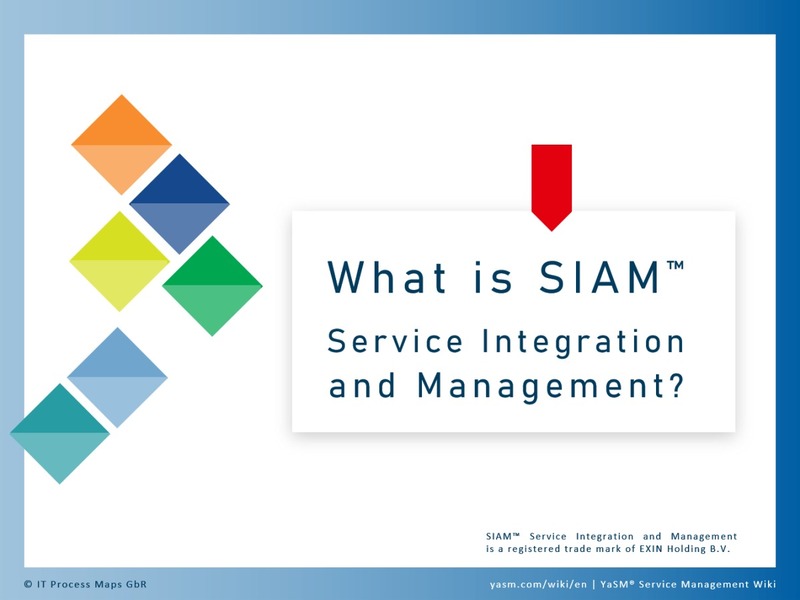 What is SIAM® Service Integration and Management? SIAM® is a 'management methodology that can be applied in an environment that includes services sourced from a number of service providers' . The acronym SIAM stands for 'Service Integration and Management'. 1 What is SIAM® Service Integration and Management? 2 How was SIAM created? 3 How does SIAM compare with other service management frameworks? 4 What guidance is contained in SIAM? 8 What SIAM certifications are available? 9 Where can I learn more about SIAM? The SIAM concept emerged around 2005 from within the UK public sector, when new types of services, such as cloud services, became more widely available. These services offered better value for money and improved flexibility, but a reliable and consistent approach was needed to coordinate multiple service providers. SIAM didn't start from nothing. Other best practice methodologies developed by the British government since the 1980s, such as ITIL® and PRINCE2®, were an obvious starting point. SIAM, however, does not seek to replace these frameworks but to augment them with a special focus on multi-sourced environments. SIAM was at first adopted by the public sector in the UK and large IT service providers. Interest picked up when, in 2010, the UK government published a new ICT strategy calling for a flexible approach using multiple service providers. AXELOS, the current owner of the ITIL framework, published several white papers in 2015, and in 2016 the SIAM Foundation Architect Group was formed by Scopism. This has led to the publication of the SIAM Foundation Body of Knowledge  and SIAM Professional BoK , and to the introduction of the SIAM certification scheme. How does SIAM compare with other service management frameworks? All service management frameworks and standards acknowledge that most service providers use supporting services operated by third parties. They typically include activities for managing suppliers and concepts such as underpinning contracts and the service portfolio to 'orchestrate' their externally supplied services and align them with the requirements of their customer-facing services. So one could argue that organizations following the advice of other service management best practice, such as ITIL and ISO 20000, are set up as 'service integrators' already. Indeed, SIAM is sometimes called an 'adaptation' or 'evolution' of ITIL. Many processes in a SIAM 'ecosystem' are familiar processes like incident management and business relationship management, and the SIAM approach should be combined with the ITIL service lifecycle approach. The point is that SIAM provides guidance for enhancing and adapting these practices and processes for multi-sourced service delivery models. SIAM can also be combined with other practices from the service management domain and beyond, in line with the specific requirements of the organization. In particular, philosophies like Lean, Agile and DevOps have been gaining traction, helping organizations to build more efficient SIAM models. What is the difference between YaSM and SIAM? How do the YaSM process templates support the adoption of SIAM processes? What guidance is contained in SIAM? and SIAM Professional Body of Knowledge [Scopism, 2017-3]. All can be downloaded free of charge from the Scopism website, and their contents are the source material for the EXIN BCS Service Integration and Management certifications. The first chapter of the SIAM BoK introduces SIAM and its origins in other service management practices, and provides an overview of what is included in the SIAM methodology. The service integrator layer is SIAM's unique concept to ensure appropriate governance across all service providers. Externally sourced: An external party takes the role of the service integrator. Internally sourced: The service integration capability is provided with the organization's internal resources. Lead supplier: The role of service integrator is taken by an external party that is also an external service provider. Hybrid: The organization collaborates with an external party to provide the service integration capability. For each practice, the SIAM Foundation BoK gives an example and illustrates how it can be applied in a SIAM ecosystem. SIAM is not a process, nor does it define a set of processes that organizations should introduce. But SIAM acknowledges that processes are a key element of the SIAM models adopted by individual organizations, and advises that organizations use other processes, which are often familiar ones from other service management practices like ITIL and ISO 20000. These processes should be adapted and enhanced with the SIAM guidance, as necessary to support the integration of multiple-sourced services. To help organizations with choosing the right processes, the SIAM BoK includes a collection of 'commonly used' processes with high-level descriptions (see below: SIAM Foundation Process Guides). Another key element in a SIAM ecosystem are defined roles and responsibilities. The SIAM roadmap (see below) therefore includes activities to define, allocate and monitor roles and responsibilities. RACI matrices are a useful tool for mapping the SIAM roles. SIAM "Structural elements" are organizational entities that have specific responsibilities in the SIAM ecosystem. The SIAM roadmap includes activities for running and improving the organization's SIAM model, so it's not the description of a one-time initiative but of an ongoing effort to adopt and maintain the SIAM ecosystem. The SIAM roadmap is thus arguably similar to the service lifecycle concept known from other service management practices. SIAM builds on other practices and adapts them to work in a multi-service provider environment. The section about SIAM and other practices is thus a key part of the SIAM guidance. For each practice, SIAM provides a short summary and highlights its relevance in a SIAM 'ecosystem'. The authors of the SIAM BoK also provide arguments for adopting the SIAM approach. They describe the drivers and motivations for moving to a SIAM model, which can be used to create a business case for the transition to SIAM. The last section of the SIAM BoK describes common challenges and risks associated with adopting the SIAM approach, and ways of addressing those challenges and risks. The SIAM Professional BoK builds on the SIAM foundation publication and provides practical guidance for each of the four stages in the SIAM roadmap. This includes advice on how to address the typical challenges and pitfalls when adopting the SIAM approach. In addition, the Professional BoK contains summarized information about practices that support the transition to SIAM, such as project management and organizational change management, as well as some real-world case studies. What SIAM certifications are available? The SIAM training and certification program is operated by a collaboration between BCS, EXIN, APMG and Scopism. The SIAM Foundation certificate has been available since March 2017. SIAM Professional is currently in development. Where can I learn more about SIAM? [Scopism, 2017-1] Dorst, S., Major-Goldsmith, M. (2017). Service Integration and Management (SIAM®) Foundation Body of Knowledge. Scopism. [Scopism, 2017-2] Dorst, S., Major-Goldsmith, M. (2017). Service Integration and Management (SIAM®) Foundation Process Guides. Scopism. [Scopism, 2017-3] Dorst, S., Major-Goldsmith, M. (2017). Service Integration and Management (SIAM®) Professional Body of Knowledge. Scopism. [Van Haren, 2015] Armes, D., Engelhart, N., McKenzie, P. & Wiggers, P. (2015). SIAM Principles and Practices for Service Integration and Management. Zaltbommel, NL: Van Haren Publishing. SIAM® is a registered trade mark of EXIN Holding B.V.